Previous functional classifications of streets provided a hierarchy that correlated traffic flow to land access. Traffic volume, speed, and level of service provided the basis for design criteria. 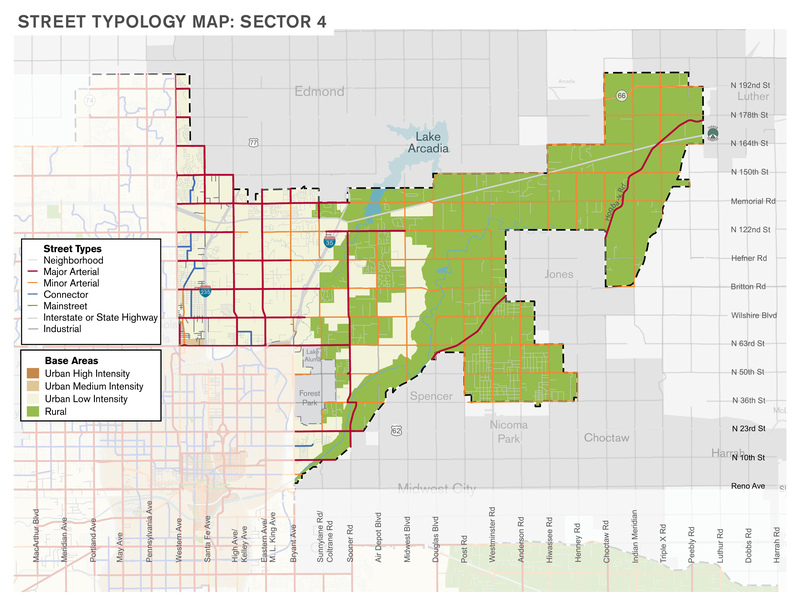 This classification system fell short in the consideration of other users of the public right of way (pedestrians, bicyclists, and transit) and was void of context for how adjacent land uses impacted the street and vice versa. 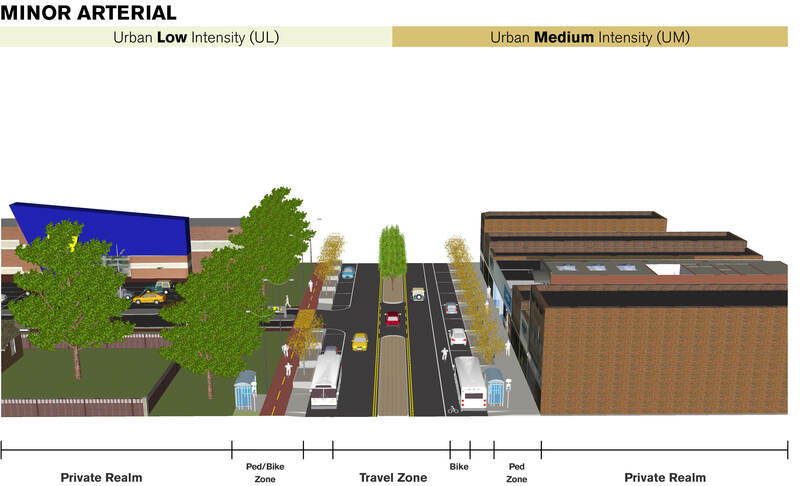 When designing roads, focusing only on traffic volume and speed is less productive than a contextual approach that considers nearby land uses, multiple user groups, and the creation of a sense of place. 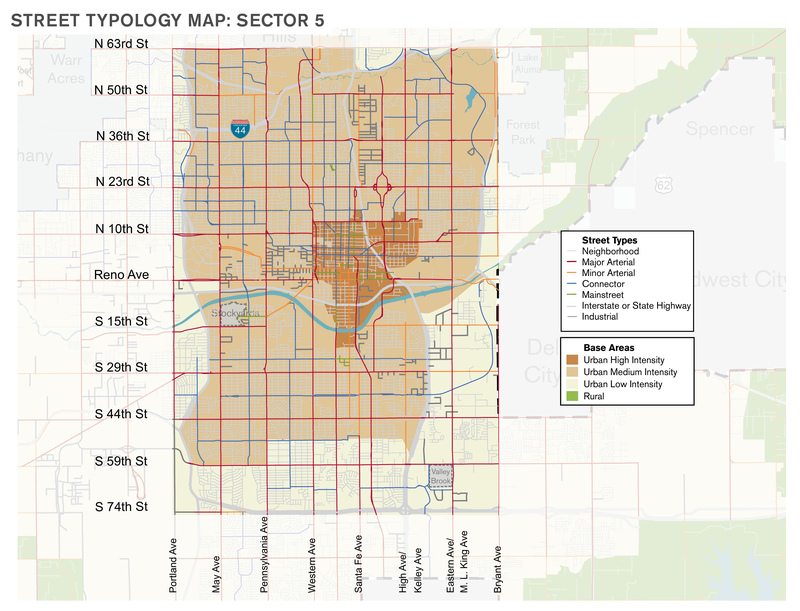 The Street Typology augments the previous classification method with new, user-oriented considerations moving beyond considering the street system as a mere conveyor of automobiles. 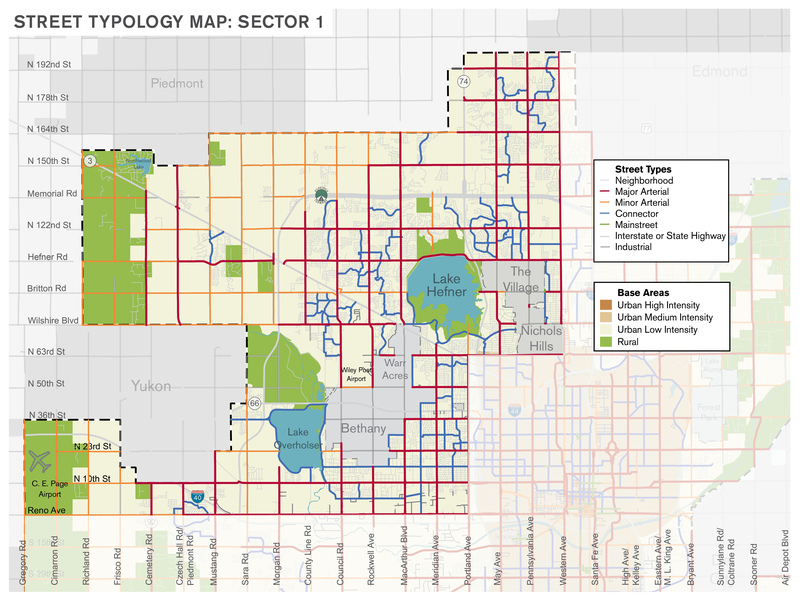 While the Street Typology is the City’s new set of guidelines for street design, the functional classification system will continue to be used for federal purposes and where City code requires its usage. 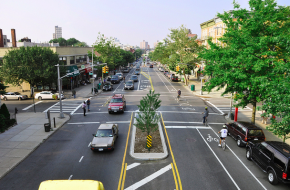 The Street Typology provides ranges of acceptable design parameters, but all designs are subject to engineering review to ensure safety and functionality of the system. 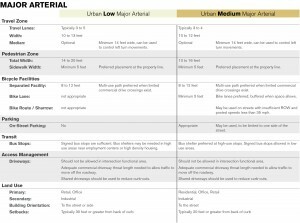 The maps and tables that follow include guidelines for accommodating elements within the public right-of-way. Elements vary, depending on LUTA, the expected intensity of development, and physical conditions and constraints. Provide adequate facilities for active transportation to improve public health throughout the city. 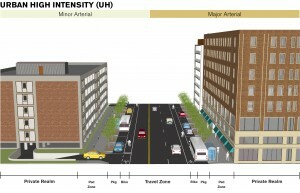 Description: Moving people across the city is the priority of the arterial system. 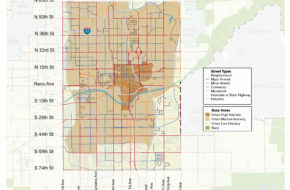 Arterial streets need to accommodate through traffic, access to adjacent uses, and connections to the highway system. At the same time pedestrians, bicyclists, and transit users must be considered. Good access management needs to be utilized to protect traffic flow and increase safety. The interaction between the arterial and the abutting lower intensity districts will be determined by how other street types connect to the arterial system. How this interaction is achieved is key to ensuring land uses work together. 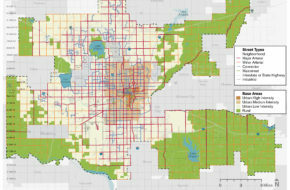 Priority Design User: Traffic flow and connectivity are the primary functions of the Arterial. Sidewalks should be separated from the roadway to the greatest degree possible. Bicycles should be accommodated with dedicated space such as cycle tracks or trails, or provided for on alternative routes. Cyclists can be accommodated on rural arterials with the use of wide shoulders. Access Management: Access management techniques that improve the function of intersections (eliminating driveways from the functional portion of the intersection, median-controlled left hand turns, adequate throat lengths into parking lots, etc.) should be utilized. Where possible, driveways should be shared to reduce the number of collision points and reduce potential congestion problems. 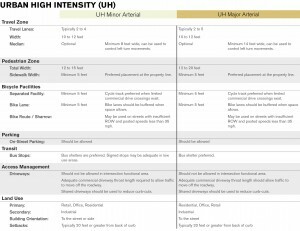 This diagram shows the various components of Major and Minor Arterials possible in the Urban High Intensity LUTA. 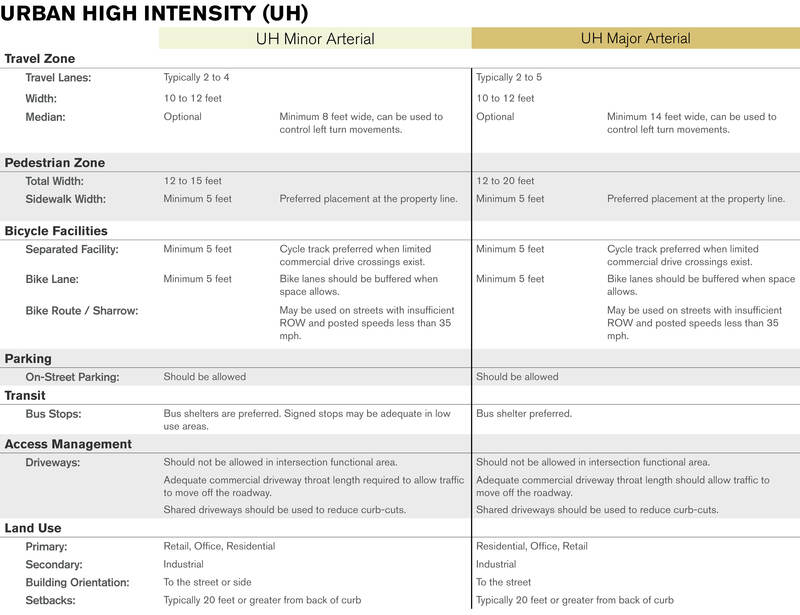 This table describes the various components of Major and Minor Arterials possible in the Urban High Intensity LUTA. 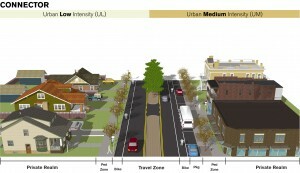 This diagram shows the various components of Major Arterials possible in the Urban Low and Urban Medium Intensity LUTAs. 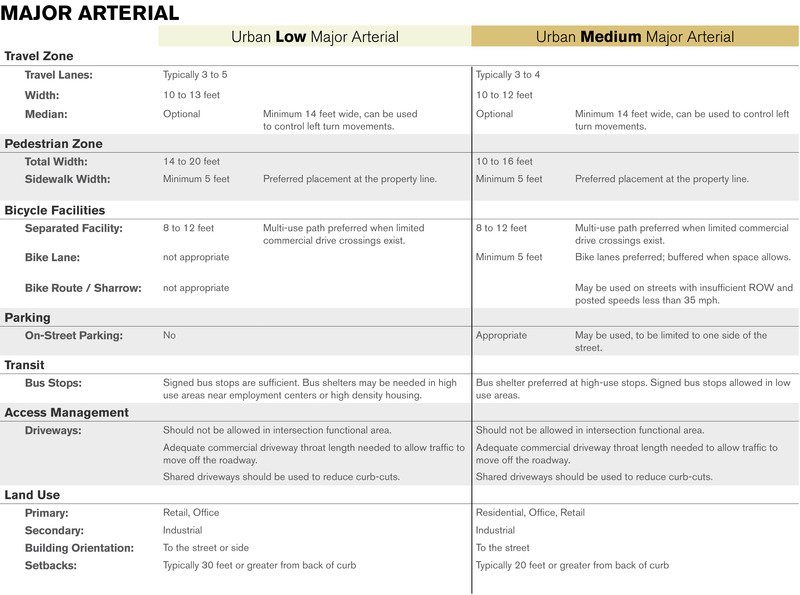 This table describes the various components of Major Arterials possible in the Urban Low and Urban Medium Intensity LUTAs. 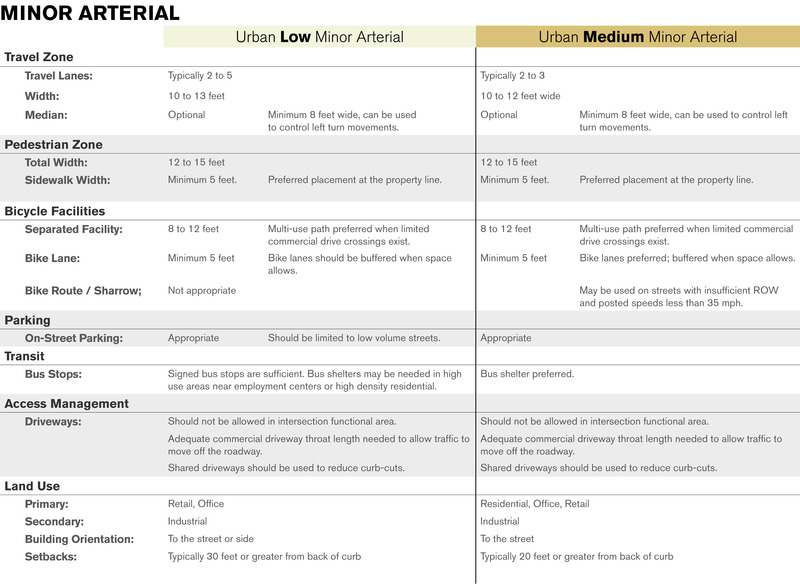 This diagram shows the various components of Minor Arterials possible in the Urban Low and Urban Medium Intensity LUTAs. 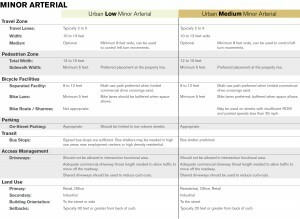 This table describes the various components of Minor Arterials possible in the Urban Low and Urban Medium Intensity LUTAs. 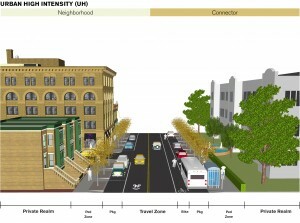 Description: Connectors are the streets that move people through and between their neighborhoods. 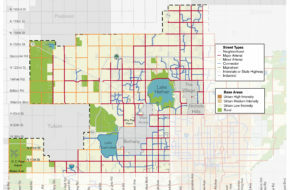 They connect to surrounding areas and uses, and become a secondary network of streets to the arterial system. Connectivity is important for all street types, but imperative for the Connector as it creates an opportunity for pedestrians and bicyclists to use a corridor separate from higher volume streets. 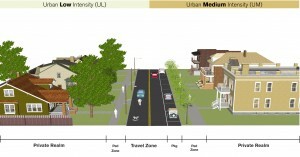 Priority Design User: Pedestrians and cyclists should be accommodated by creating slow vehicular travel speeds. 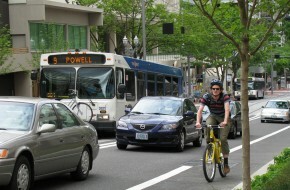 Bike infrastructure could include lanes or sharrows. Safe pedestrian crossings should be achieved through well demarcated crosswalks, bulb-outs, and signage. Intersections with arterials need to be designed for safe pedestrian and bicycle traffic. Access Management: Driveway cuts should be kept to a minimum while allowing local access to adjacent residential, commercial, or industrial development. 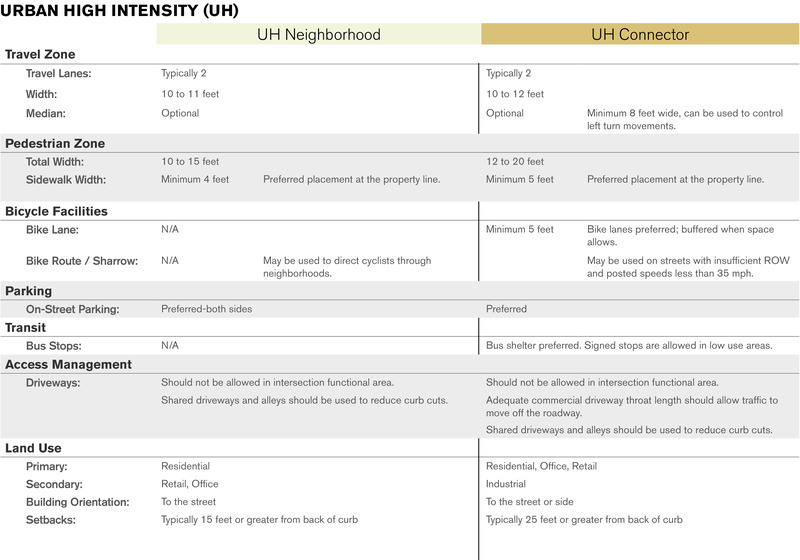 This diagram shows the various components of Neighborhood & Connectors possible in the Urban High Intensity LUTA. 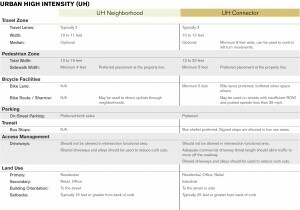 This table describes the various components of Neighborhood & Connectors possible in the Urban High Intensity LUTA. 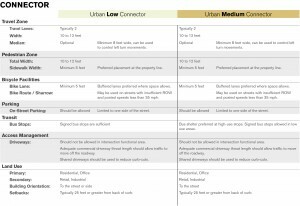 This diagram shows the various components of Connectors possible in the Urban Low and Urban Medium Intensity LUTAs. 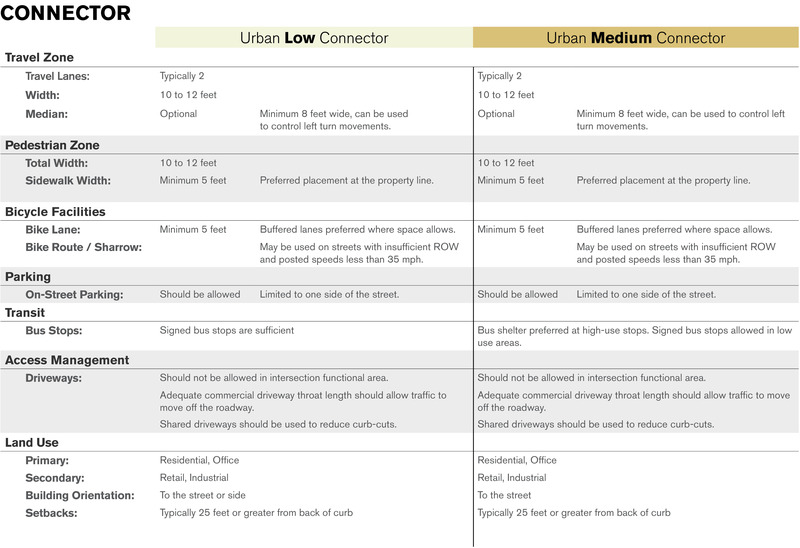 This table describes the various components of Connectors possible in the Urban Low and Urban Medium Intensity LUTAs. 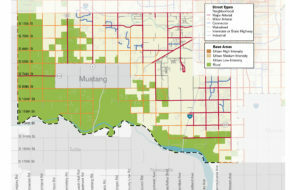 Description: These streets primarily serve residential uses. 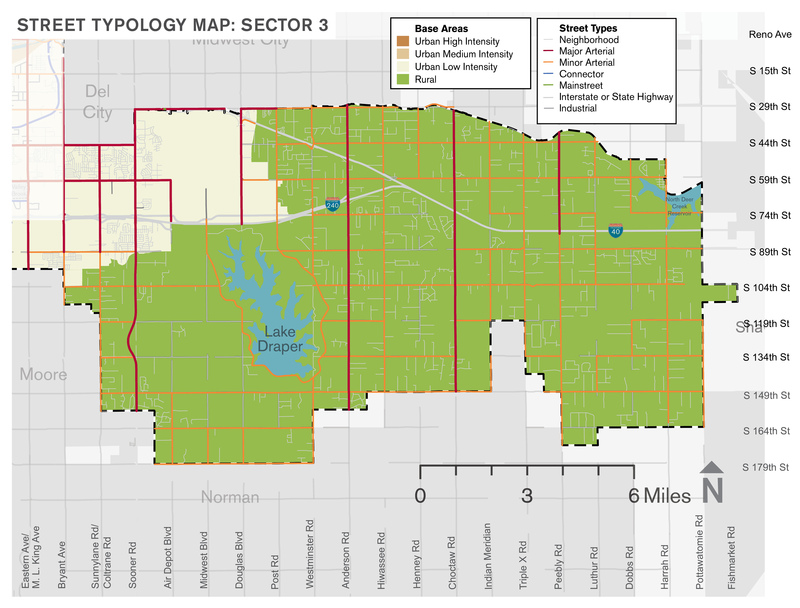 However, street and neighborhood character can vary dramatically between very urban (Urban High), suburban (Urban Low), and rural contexts. Regardless of the context, neighborhood streets are meant to move people to and from the places they live. But more than that, they are the public realm in which the social interactions occur that make a neighborhood more than a collection of houses. Efforts should be made to ensure that traffic moves at a slow pace, that connectivity is promoted, and the character of the street is a noticeable benefit to the people who live there. 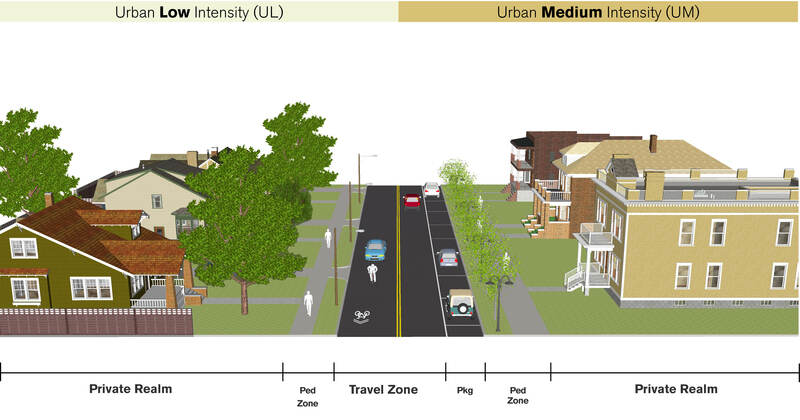 Priority Design User: Pedestrians should be accommodated by creating slow vehicular travel speeds. Safe pedestrian crossings should be achieved through well demarcated crosswalks, bulb-outs, and signage. Bicycles can be accommodated in the travel way intermixed with slow moving traffic. 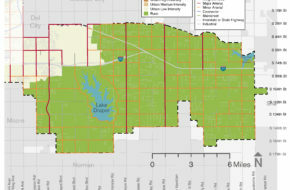 Access Management: Local access should be provided to adjacent residential, commercial, or industrial development. This diagram shows the various components of Neighborhood Streets possible in the Urban Low and Urban Medium Intensity LUTAs. Description: Main Streets contain a mix of activities and are defined by the character of the district surrounding them. Generally they are the streets on which a person could live, work, and shop. 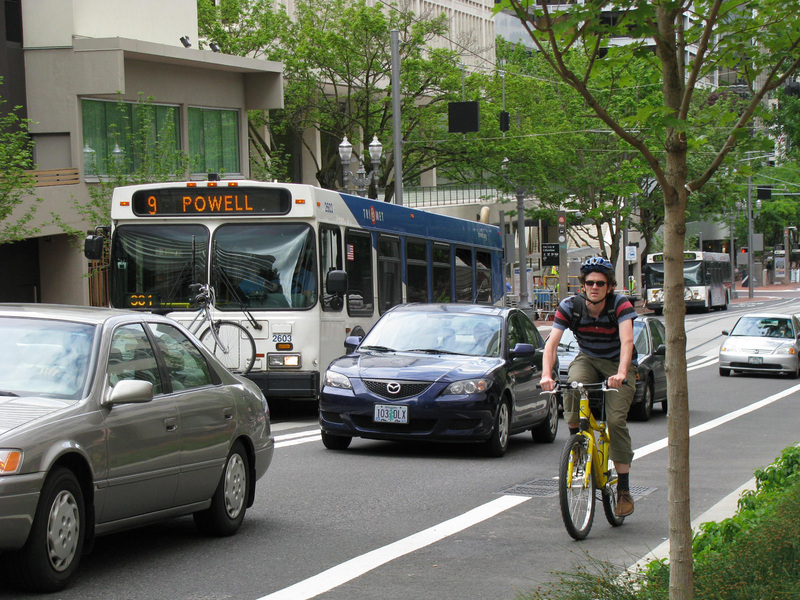 Because they touch so many varied uses they have to comfortably accommodate a multitude of users, including pedestrians bicyclists, transit riders, and drivers. Priority Design User: The priority consideration in design should be pedestrians. As such, blocks should be shorter and there should be a high level of connectivity. The pedestrian zone should be generous containing safe and inviting sidewalks with emphasis placed on safe crossings when traversing from one side of the streets to the other. 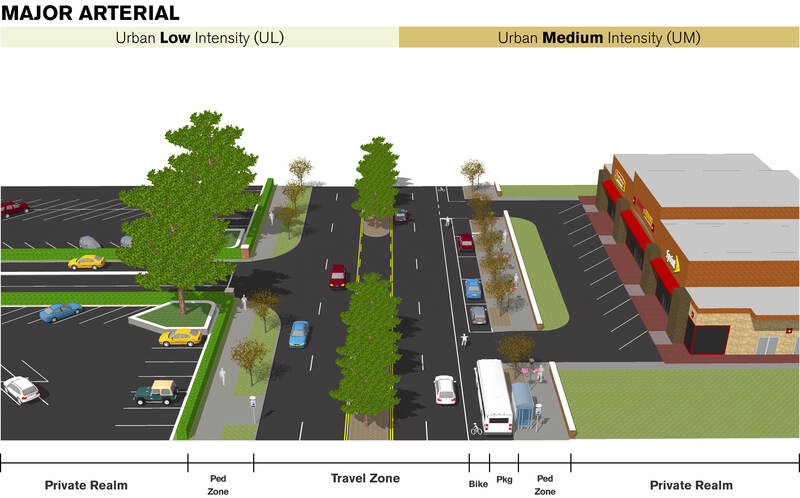 Street design that accommodates low-speed traffic through the use of bulb-outs, reduced curb returns and narrow widths on the vehicle travelway should be the norm. Access Management: High level of access management required to preserve the pedestrian environment and maintain reasonable traffic flow. Description: Uses along industrial streets are unique. Streets associated with this use must move goods and materials on large vehicles while being connected to the arterial and highway systems. 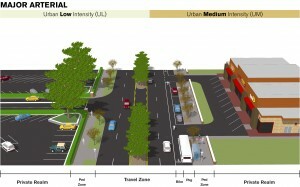 Design considerations include larger curb radii and wider lane widths. 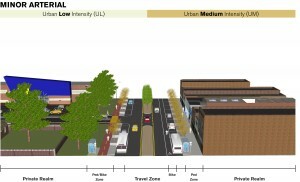 Description: Downtown Oklahoma City requires a special Street Typology that accommodates high volumes of pedestrian and transit activity. 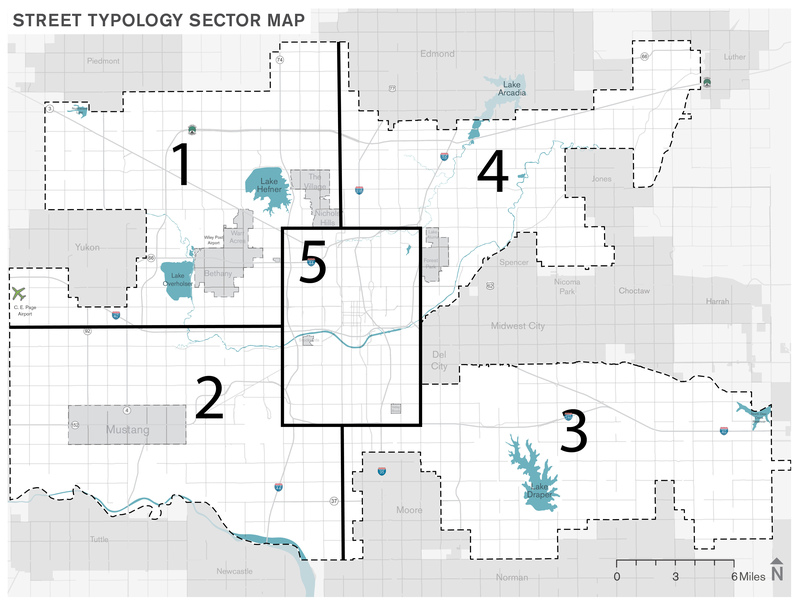 For the appropriate typologies related to Downtown, refer to the Downtown Development Framework document. Access management is the systematic control of the location, spacing, design, and operations of driveways, median openings, interchanges, and street connections to a roadway. 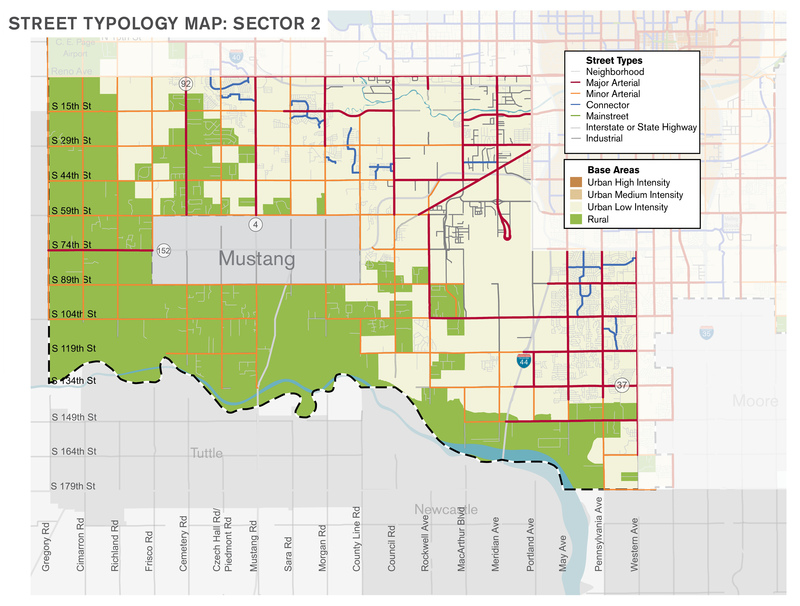 The purpose of access management is to provide vehicular access to developed land in a manner that preserves the safety and efficiency of the transportation system. Within the context of street typologies, access management should be a guiding principle, the details of which will be addressed as a roadway is built, reconstructed, or otherwise improved. 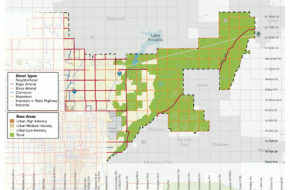 The land use context, the functional intent of the road, and the engineering constraints of each project influence the specific access management techniques for any given project. 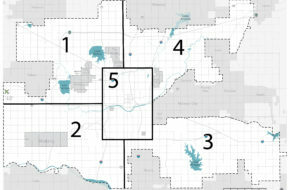 Some areas of Oklahoma City have been prioritized for access management improvements as described in the Access Management Focus Areas section. 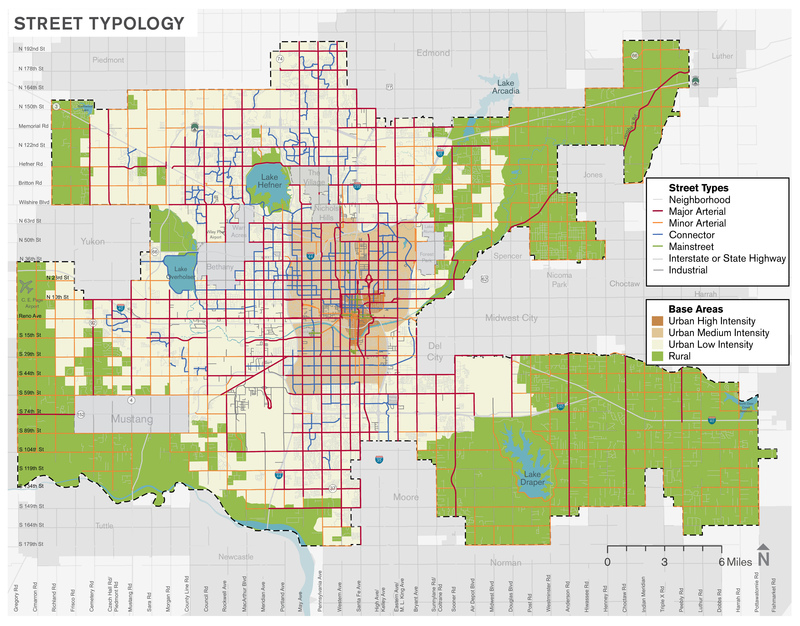 One of the guiding principles of the Street Typology is to ensure that the needs of all users are balanced, including automobiles, pedestrians, bicyclists, and transit-riders.